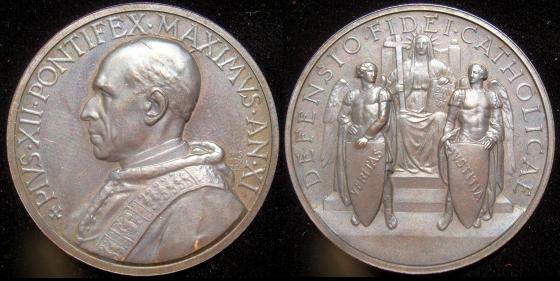 Official Vatican bronze Annual Medal, year XI, of Pope Pius XII in memory of the work in defense of the Catholic faith. Obverse: bust left; Reverse: Representation of Faith, cross in right hand and Gospel in her left hand, seated on throne. In the foreground, two angels holding shields VERITAS (Truth) and IUSTITIA (Justice).